Wanted to make sure everyone is in the loop as much as possible. I know I’ve been getting tons of emails on the subject. I’ve let the city know that I’m not planning on putting on the Marietta Zombie Walk this year. 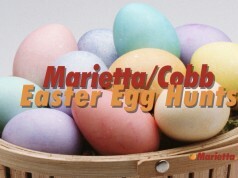 I’ve been searching for some folks that may be interested in taking up the cause but those haven’t panned out so far. It’s been a great 5 years but as a one man show I just couldn’t find enough time this year to make it happen. For now this is just a 2016 thing and things may change for 2017. Some other cities have also been asking to have such events. Ya never know. Planning this event and finding sponsors has become a massive undertaking so looking at 2016 as a regrouping year. Please keep giving to MUST Ministries as much as you can. 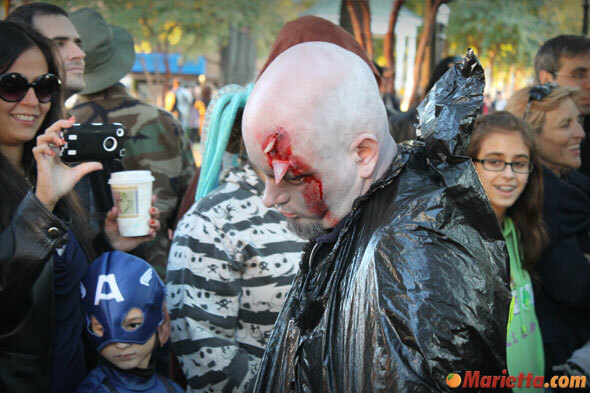 Keep an eye peeled over at Carnival of Doom for what’s next. Will have some things brewing over at The Burnt Hickory Brewery in October as usual as well as some possible one-off weird things. The dead will walk again soon. 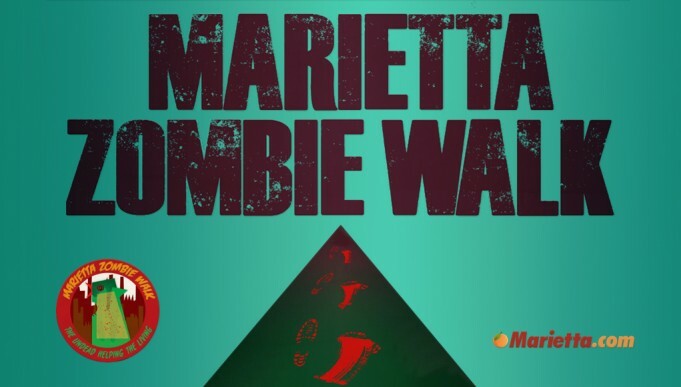 All proceeds and collected food from the Marietta Zombie Walk goes directly to MUST Ministries in their mission to help local humans in need. 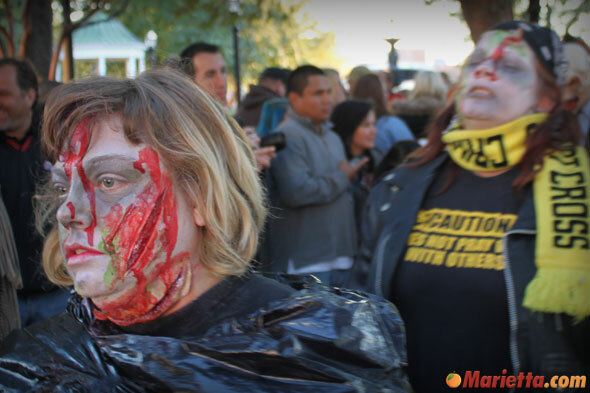 What’s a Zombie Walk? 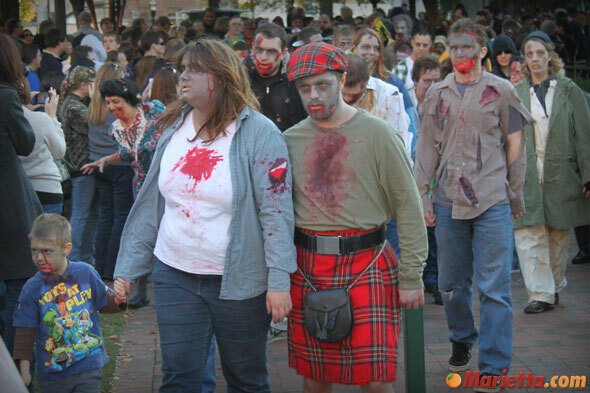 A Zombie Walk is an organized (as organized as zombies can be) public gathering of people dressed in zombie costumes (we hope these are only costumes). 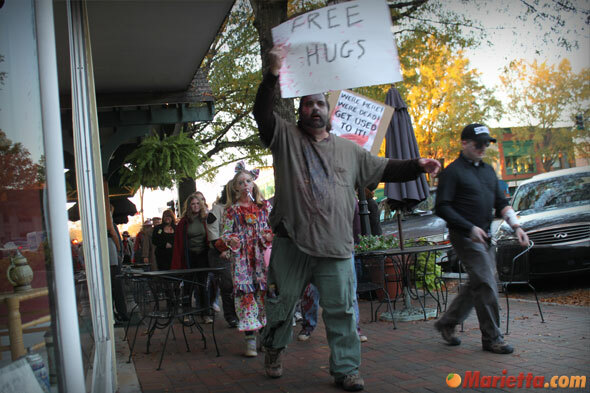 The walks take place in an urban center as the participants make their way around city streets and through public spaces in an orderly fashion. 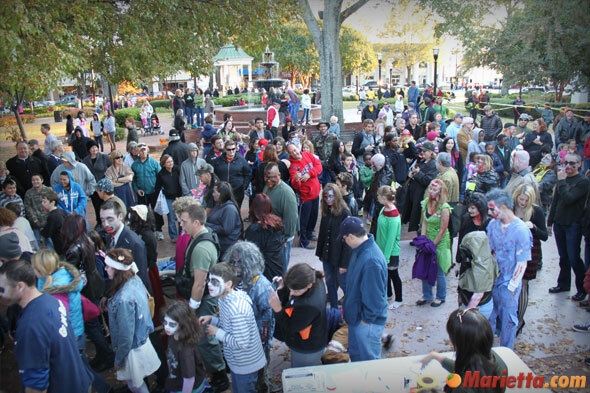 In Marietta, the undead will again roam the streets around Marietta Square in a not-so-brisk 0.8 mile stumble. This is an undead family event. 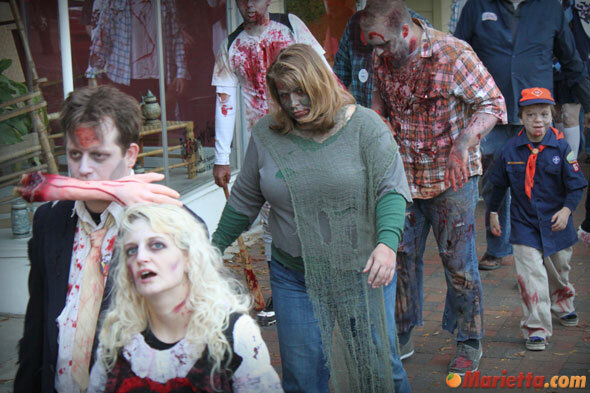 There’s a little undead in all of us, so bring out your best zombie look and food donations (human cash & credit card donations work) and join the local undead in Marietta Square. 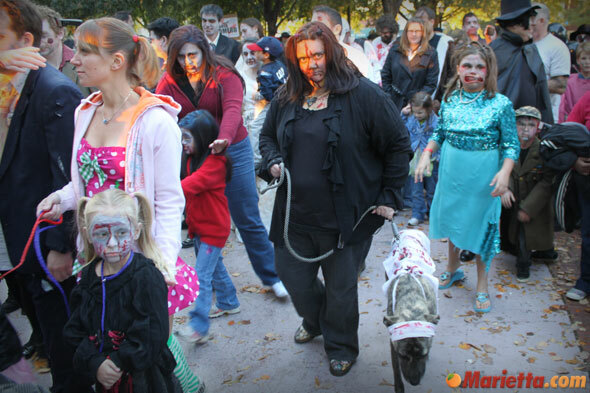 Victims Spectators are welcome to come play with us while helping the local food pantry (zombies do not need food for humans, right?) 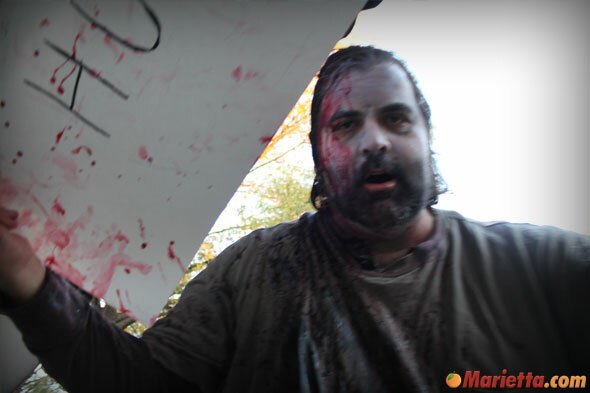 The Infestation (Gathering) starts at 5 pm in Glover Park. The Feeding (Walk) starts promptly at 6 pm. 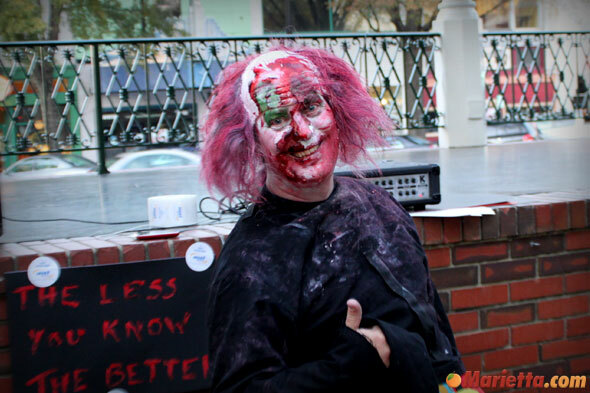 Makeup artists will be on hand during the festival to help bring out the undead for a monetary donation or arrive already in character using your own creativity. 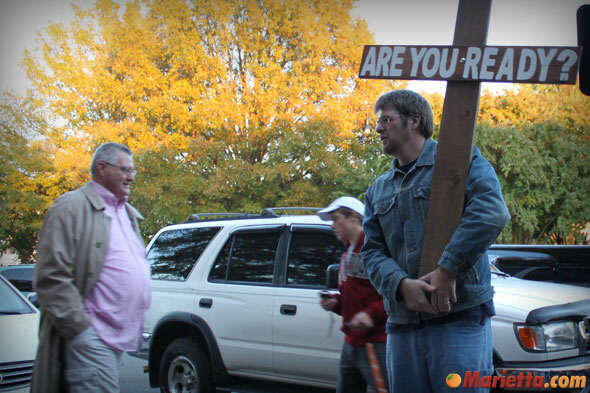 The Infestation (Gathering) starts at 5 pm in Glover Park. The Feeding (Walk) starts promptly at 6 pm. Lookin Sooooooo Forward to It !!! 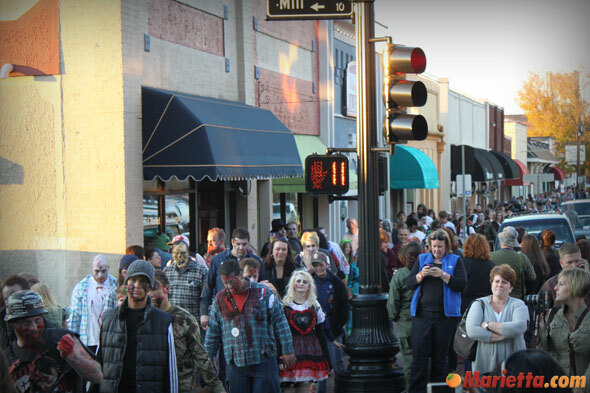 I just want to let you know that I think it’s folly to hold the “family-friendly” zombie walk during the EXACT SAME TIMES as Trick or Treat will be for the area. 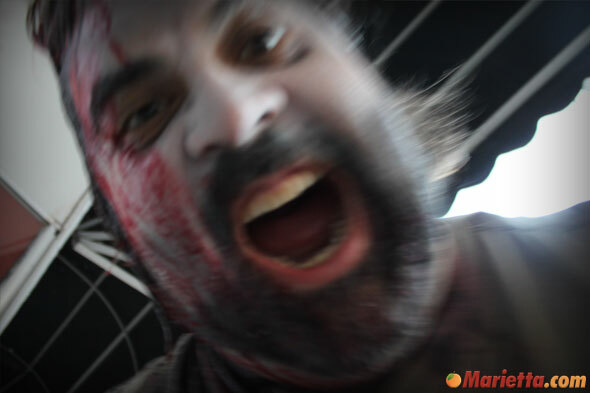 My daughter and I always look forward to donning our zombie makeup, and shambling around, however this year we won’t get to due to the aforementioned scheduling conflict. Sure, we could do both I suppose, but as she isn’t planning to be a zombie for halloween, doing Trick or treat, then rushing home, cleaning up her makeup, then applying new makeup just isn’t pragmatic. It’s a real shame, and I know I am not the only one who feels this way. Also, I want to warn you that it will SERIOUSLY impact your turnout rate this year. 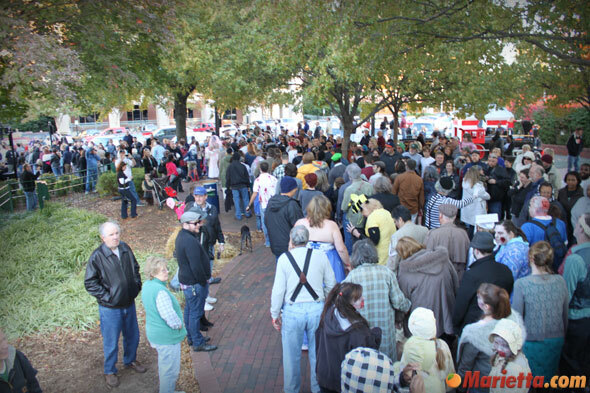 Children would rather trick or treat and their parents must weigh the two and decide which event to attend as doing both won’t be practical. I would really urge you to reschedule this, even though I know it’s not practical to do so at this point. 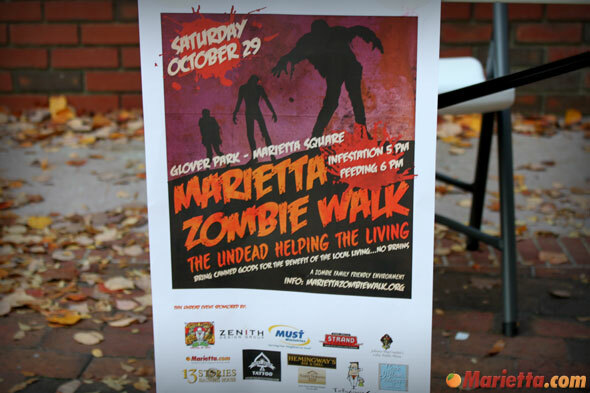 I love the Marietta Zombie Walk and am bummed that I likely won’t be able to do it this year. Sorry to hear that, Wess. 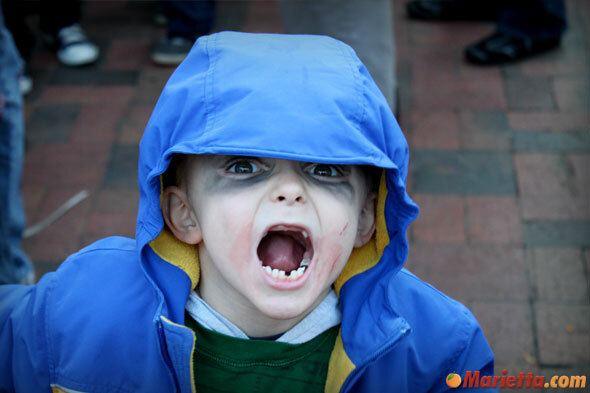 We’re pretty much going to be sticking to the saturday before halloween since the city has blessed it the past 2 years. 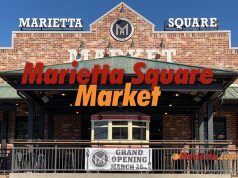 Permits already completed and such. I have kids too and understand but I’m also a stickler that Halloween and Trick or Treating is always October 31st no matter what day of the week it falls on. The time of the walk also is to make sure that any families that have other plans can come, donate food, have fun in the walk and make it to their next location before sundown. Come out early (we’ll be in the park around 2pm for makeup) and we’ll have some candy there too . Most importantly…bring food and have fun. 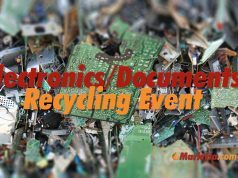 Thanks for the follow up Gary – I am sure it will be a great event. hey wess halloween is oct. 31.that is the only day i give out candy. do you only celebrate chritmas on saturdays too? 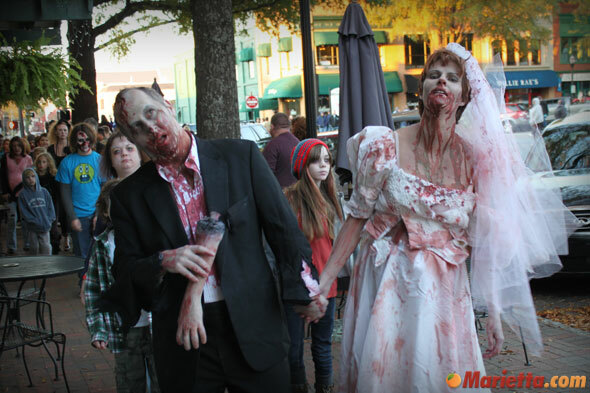 ken meaux and his wife stella will travel from the haunted swamps of louisiana to be at the zombie walk..watch for a french(cajun) VAMPIRE!! 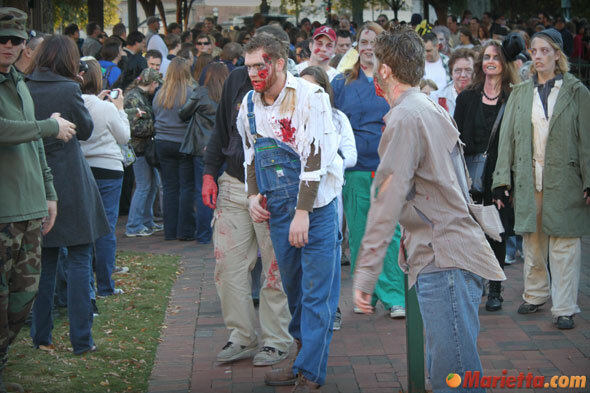 Bring your friends to Zombie night on Friday the 13th at Brunswick Zone Austell. Bowl for 2 hours for just 10.00 each shoes are included. 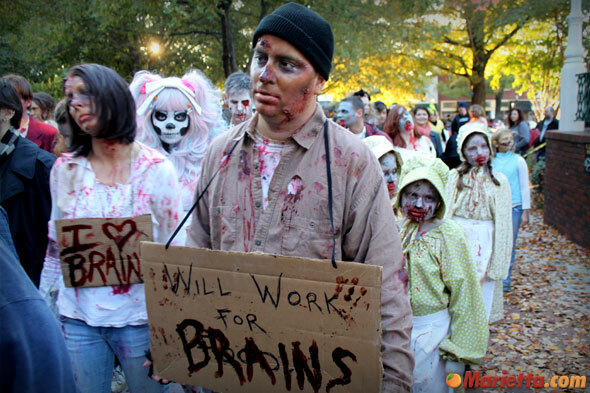 Dress as a zombie and win prizes. 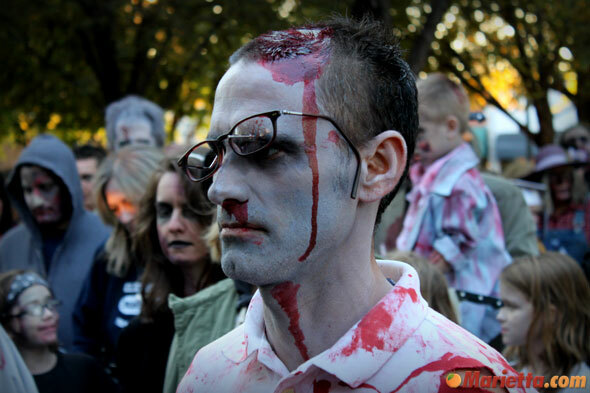 There is a contest for best dressed zombie. That’s tomorrow night at 11:00 pm. at Brunswick Zone Austell. Something fun for a zombie to do! Hello, and friend and I were interested in checking out the zombie walk this year, but frankly we already spent the time and money on our costumes for Halloween. 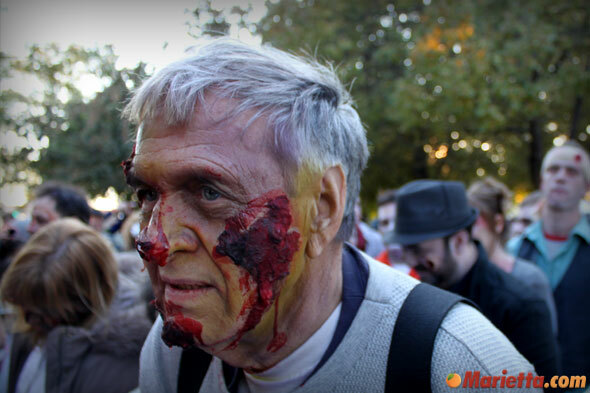 I was wondering if you necessarily have to dress as a zombie to participate? I would understand if the costumes are to differentiate between who is participating and who isn’t. We are SOOOO going to be there. 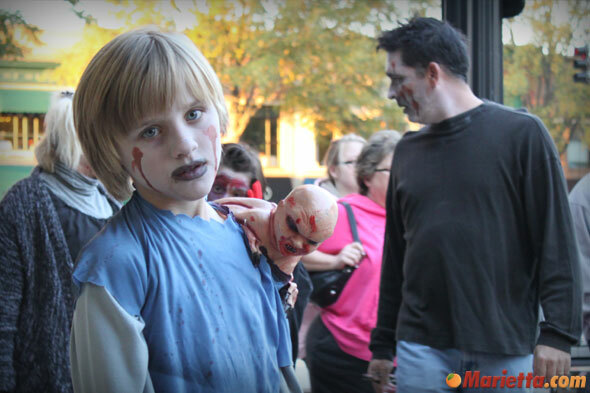 My kids love Zombie walking. Just did the Atlanta one a couple weeks ago. 🙂 Excited!